Félicia Atkinson, artist, experimental musician, and founder of the independent imprint Shelter Press, makes work that broadly thinks about improvisation, fiction, instant composition, noise, abstraction and poetry. 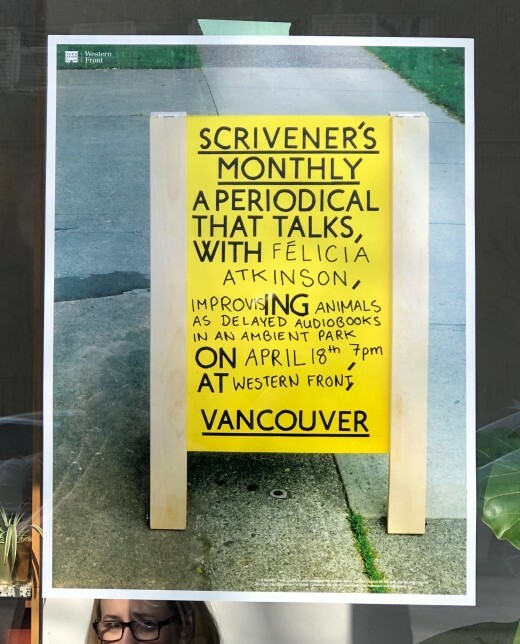 For Scrivener’s Monthly, Félicia will present a talk about her publishing practice through the lens of some of her own books such as Ambient Park, Animals, Audio Book, and Improvising Sculpture As Delayed Fictions. Co-presented with Deep Blue, where Félicia will be performing on April 20.